Comfortable, stylish and incredibly easy to use – Logitech mice have been my personal go-to brand since 2002. In fact, one of their very early models the Trackman only began failing after 15 years of use. This impressive lifespan outlasted many different PCs and laptops I owned in this time – all of which have bitten-the-dust long before my trusty Trackman. So, when the question arose of acquiring a new mouse Logitech were a brand that was top of my list. 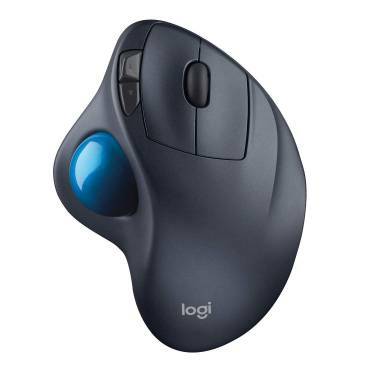 Which is why I opted for the Logitech M570 wireless trackball mouse. It follows a format and shape that has changed very little in over 20 years – simply because it works so well. One of the most appealing aspects of the M570 is its design. It’s curved body is designed to support the hand allowing your fingers to rest comfortably on the buttons and your thumb over the trackball. Using the trackball is easy and it can be used almost anywhere. From resting in your lap to being held at an angle its low profile and rubber feet help ensure it stays firmly in place. 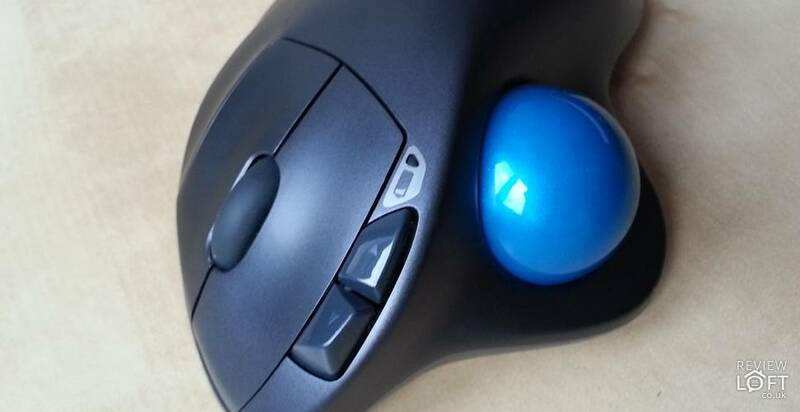 And, because its a trackball mouse its great for working in even the tightest of spaces because there’s no need to move the mouse across vast areas of your desk – simply rolling the ball moves the cursor to any point on your screen in milliseconds. The trackball itself moves easily with just the right amount of friction. It is also very precise making it suitable for general office work and more precise work such as Photoshop editing or using music/video editing packages. We regularly use it for Photoshop work and have found it far easier to select items right down to the pixel level when compared to a regular mouse. Located at the top of the mouse you’ll find two standard buttons and a scroll wheel. Rolling the scroll wheel back and forth with your index finger allows you to easily navigate through long webpages or documents with ease and is much simpler than using, for example, your laptops track-pad for this purpose. Located to the left of the standard buttons you’ll also find two smaller, raised buttons. By default, these buttons act as forward and backward buttons but they can be customized to your liking by downloading Logitech’s Control Center (for Mac’s) or SetPoint (for Windows). Many of Logitech’s wireless peripherals now feature a unifying receiver. 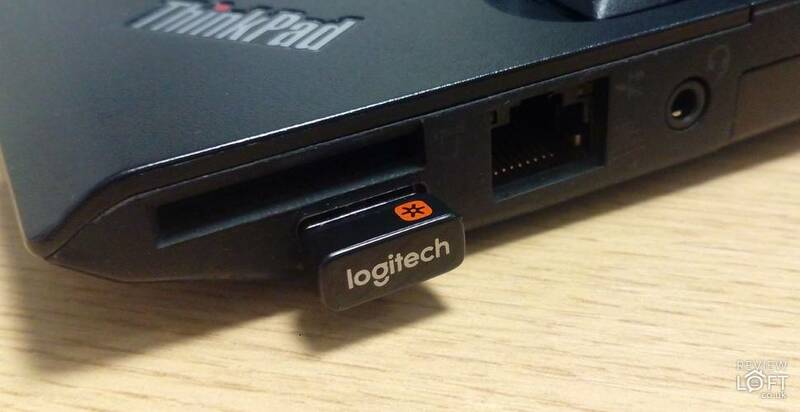 This nifty piece of technology allows you to connect up to 6 compatible Logitech devices to your PC/laptop using just 1 USB dongle. The obvious advantage here is that you won’t eat up all of your USB ports and is particularly useful when it comes to laptops or hybrid tablets where USB ports are at a premium. You’ll need to install Logitech’s unifying software in order for this functionality to work. It ensures another Logitech product in the vicinity is not accidentally paired to your PC and only connects the devices you want to be connected. The software features a simple wizard to walk you through the pairing process and there’s an advanced mode if you’re feeling adventurous which allows you to dive deeper into more complex settings for fine-tuning. The software also displays useful info about your devices such as the battery life remaining and firmware version. Power saving is incredibly important when using a wireless mouse because it simply allows you to get more productive use between battery replacements. To meet this end Logitech have included a very handy and discrete power switch on the base of the mouse. When you’ve finished using it simply switch this off to conserve its power. Located beneath the power switch is a small access cover you can remove to access the batteries. 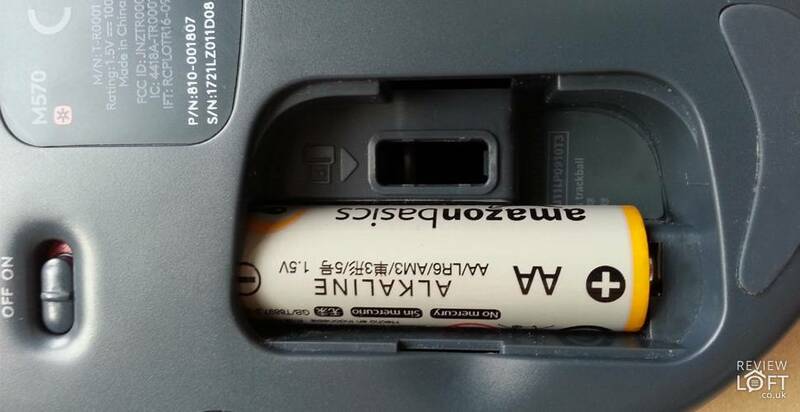 Inside you’ll find a solitary AA battery and a small rectangular recess. This recess is used to store the unifying receiver and keeps is safely stored away with the mouse as you travel around. This is very nifty and is something we’ve made use of often. As for battery life; Well, Logitech claims you can get up to 18 months usage and we’d agree with this. After heavy use it was well over a year before the battery required replacing in our unit and it seems to last forever of cheap batteries such as those from Amazon’s basic range. Overtime, like any computer peripheral, this mouse will need a quick clean. Behind the trackball dust and fluff will accumulate and this impedes its operation. Causing the trackball to feel less responsive and slower to spin. Fortunately cleaning this appliance is very simple and much easier than cleaning the old roller ball mice from the 80s or 90’s (showing your age a little if you remember those – I do!). 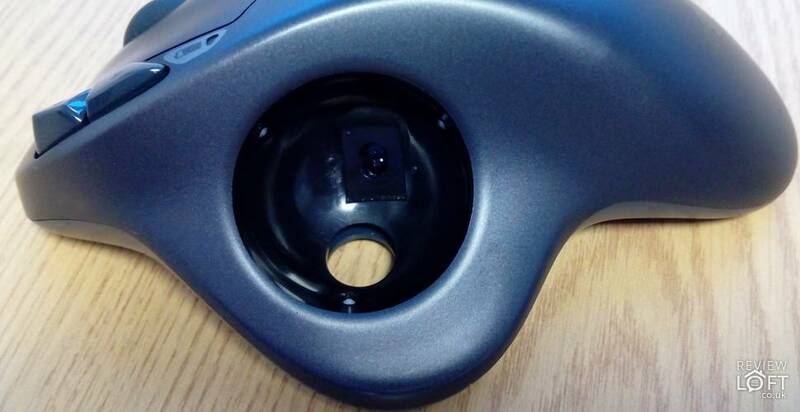 Removing the ball is simple and Logitech have included a handy hole in the base of the mouse. Pushing your finger through the hole causes the trackball to pop free. Inside you’ll notice three small contacts that the ball glides over and its these you want to clean. At the very back of the recess is the optical sensor used by the mouse to detect movement in the trackball – generally you can leave this alone. That said, sometimes the sensor will need a very careful wipe after cleaning because dirt and moisture can be accidentally knocked on to it when you’re cleaning the contacts. You’ll know you’ve obscured its vision after replacing the trackball and the mouse cursor jerks across the screen. This mouse has been in heavy use for well over a year now and it shows little in the signs of wear and tear despite some abuse from being thrown into laptop bags and carted to and from our office every day. It works straight out of the box on Linux, Mac and Windows systems and lasts an impressively long time even on bargain basement batteries. Plus its not only very comfortable to use but also precise and its wireless capabilities make it so much easier to use than being tethered to a desk with a corded model. All in all its hard to find a single thing to fault about this mouse – which is probably why Logitech have barely changed its design in 20 years.